"John Barell's book is a rich and ripping read that will not only captivate but also educate its audience. . . Anybody who has ever been a parent will come away moved. Anybody who has ever been to Antarctica will come away with new perspectives on the continent they thought they understood." Dr. Susan Solomon, Antarctic scientist, winner of the 2007 Nobel Peace Prize as co-chair of Working Group 1 of the Intergovernmental Panel on Climate Change, and author of The Coldest March. "This human story," said Dr. Solomon, "is both moving and insightful, coming as it does from the unique perspective of an educator. . . 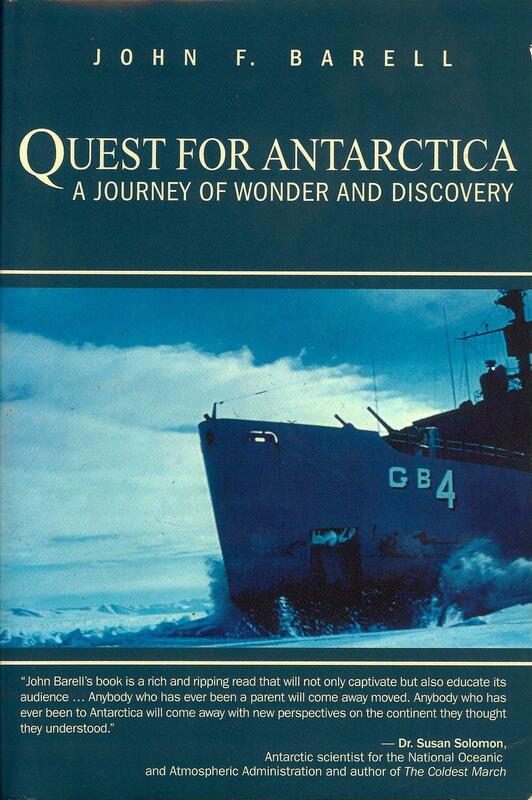 It is a slice of life in the Navy during an epoch era, touching on a diverse canvas of naval history and its central role in the U.S. involvement in the Antarctic." Quest for Antarctica tells the story of a boy's growing up with a deep passion and curiosity about polar explorers, his sailing south on his hero's flagship icebreaker (USS Glacier) and then becoming an educator who works with schools around the country to foster the same spirit of inquisitiveness within all teachers and students.